Greenhouse gas emissions have warmed the oceans in regions such as the Baltic by as much as 1.3°C. It is now thought that 90 per cent of the heat added to the climate system by humans has been absorbed in the oceans, a significant amount of which is between depths of 700 to 2000m. As a result, marine species are now moving towards the poles, chasing seas of cooler, more comfortable temperatures. This is happening broadly along the predictions provided by models based on species’ preferences and projected ocean temperature change. Some ecosystems are now under direct threat as a result of such temperature changes, most obviously tropical coral reefs. Here, temperature rise together with natural climatic variation has exceeded coral’s tolerance. This leads to mass coral bleaching, where excessively warm water causes the coral to eject the algae that live symbiotically in its tissues. These algae give coral its bright colours and also feed it energy and nutrients. 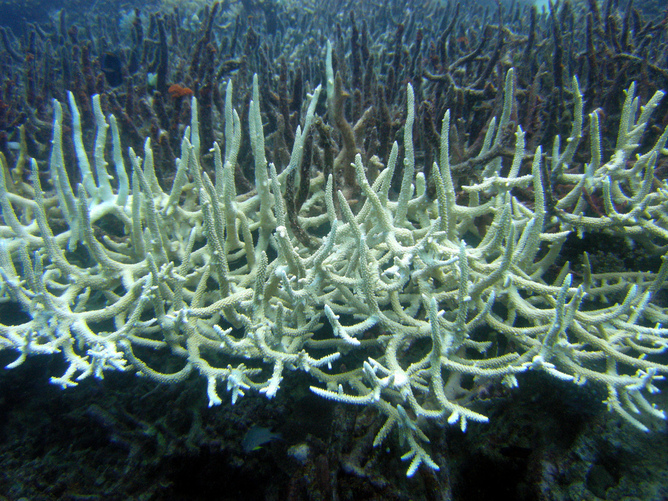 When they are expelled, coral is left bleached white, and dies. Mass coral bleachings across large areas first occurred in 1979 and there have been dozens since. The very warm El Niño of 1997-98 is estimated to have killed 16 per cent of the world’s coral reefs. The oceans are affected by another phenomenon caused by CO2 emissions, referred to as global warming’s “evil twin”: ocean acidification. The oceans absorb about a third of the CO2 we emit, which is converted to carbonic acid (H2CO3) in seawater. This has led to a decrease in 0.1 pH – an increase in acidity – of seawater since the industrial revolution. This may sound a trivial change, but pH is a logarithmic scale, so in fact it represents a 30 per cent increase in acidity. And geologically speaking the time in which this has happened is less than the blink of an eye, a rate of acidification not seen for perhaps 300 million years. Science is playing catch-up trying to understand the implications of acidification for marine life. One of the obvious consequences is that as the ocean becomes more acidic (or more accurately, less alkaline or basic) the concentration of calcium carbonate (CaCO3) in seawater reduces. This affects species which secrete shells or skeletons made of aragonite and some forms of calcite, seen by observing the sealife around natural volcanic CO2 vents in the Mediterranean and Papua New Guinea. At vents near Ischia, in the Mediterranean, mussels and limpets and corals show reduced growth of shells and skeletons as acidity rises. These animals disappear from around the vents possibly through competition with algae that do better at higher CO2 concentrations. The combination of warming water and lower pH seems also to further reduce their ability to calcify, and therefore grow. In Milne Bay, Papua New Guinea, complex reef-building corals and other important elements of reefs such as calcified coralline algae also disappear from waters influenced by bubbling CO2. This indicates that reef ecosystems may undergo major changes in structure and species diversity as a result of acidification. This, together with mass coral bleaching events, suggests that these coral ecosystems will disappear within a few human generations. But cold, polar waters are also vulnerable to acidification because cold water absorbs more CO2. Projections suggest that areas of the Southern Ocean where calcium carbonate levels are seriously low within 20 years. Already, sea butterflies – small, shelled molluscs that swim in the upper ocean – have been captured in a region of the Southern Ocean with corroded shells. The naturally more acidic seawater here combined with the effects of acidification has already had an impact on species that are important for Antarctic food webs. The larval development of Antarctic krill, the keystone species in Antarctic waters, is severely affected at the high CO2 levels that may occur by the end of the century or beyond. While the Southern Ocean includes some of the most productive waters on Earth and the most spectacular marine predators, the impact of rising temperature and acidity could be extremely severe. Other effects of ocean acidification are less predictable. For example, it alters the chemistry of pollutants, potentially changing their toxicity. It also interferes with the ability of sea creatures to “smell” their environment, affecting the selection of suitable nest sites or predator-prey responses. The ecosystem-level effects of this are as yet unknown. Why does rising ocean warming and acidification matter? For a start, it threatens an important source of food – especially considering that many important fisheries worldwide are already overfished. But more than that, life in the oceans shapes the fundamental processes of the Earth’s major biogeochemical cycles – cycles which, ultimately, maintain the conditions upon which the present-day biota of Earth, including humankind, rely. The likely effects of climate change will be a reduction of species biodiversity, changing ecosystems, possible declines in vital species at the base of food webs and feedbacks that reduce the ocean’s capacity to absorb CO2. Ultimately, it entails unknown but inevitably huge economic and societal consequences for humankind. And, taking a queue from episodes of climate change in the ancient past that triggered wide-scale extinction events, once the CO2 is in the atmosphere and the oceans, returning to previous background levels through natural processes will take in the order of thousands to hundreds of thousands of years. Alex Rogers is a professor of Conservation Biology at the Department of Zoology and a fellow of Somerville College, University of Oxford. This post originally appeared here.